The US government has begun to reunite children with their parents after they were forcibly separated at the US border. A new report claims federal officials are pressuring parents to give up their asylum claims and accept voluntary deportation to see their kids faster. Some experts doubt whether the government will honor the alleged deportation-for-reunification agreement. Parents who have been separated from their children at the US border have reportedly been pressured to volunteer for deportation in exchange for seeing their kids again. A 24-year-old Honduran father who is currently being detained at an Immigration and Customs Enforcement (ICE) facility in Livingston, Texas, told The Texas Tribune on Saturday that he was asked to give up his asylum application and sign a voluntary deportation in order to see his daughter. Two federal officials allegedly told him he would be reunited with his six-year-old daughter at the airport before they were returned to Honduras if he agreed. The man, who was identified under the pseudonym of Carlos, is now trying to rescind the form he had signed. He told The Texas Tribune: "I was told I would not be deported without my daughter. 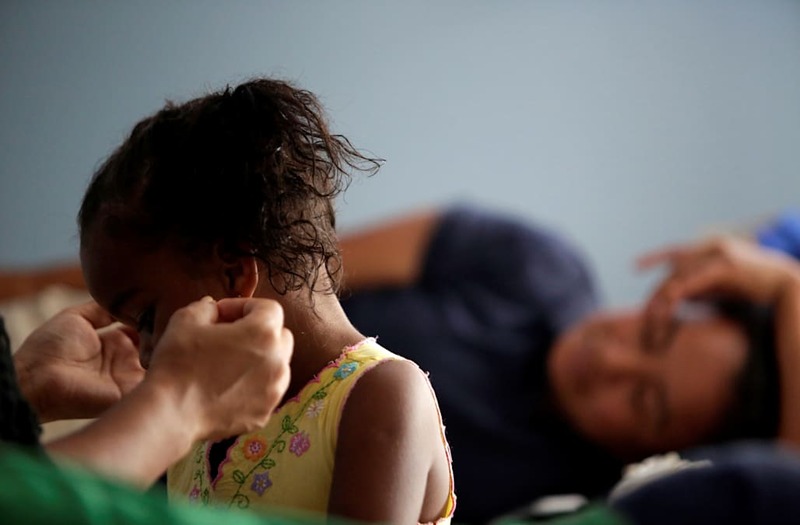 I signed it out of desperation... but the truth is I can't go back to Honduras; I need help." Carlos is currently being detained at an Immigration and Customs Enforcement (ICE) facility in Livingston, Texas, and was told that his daughter is in Arizona, around 1,000 miles away. Carlos and his daughter were separated late last month in McAllen, Texas, after crossing the US-Mexico border illegally and turning themselves into Border Patrol. They have been able to speak on the phone once since their separation. It appears he is not the only parent facing such a situation. He told the Texas Tribune that 20 to 25 other men detained alongside him at the IAH Polk County Secure Adult Detention Center were given the same choice. Anne Chandler, a director at the Tahirih Justice Center, a charity for immigrant women and girls, said she had heard a similar account. Jacob Soboroff, an MSNBC correspondent, also reported on Sunday that parents were "quickly given the option" to sign deportation paperwork, and "many chose to do so," citing a DHS official. NEW: DHS official tells me this morning separated parents were quickly given the option to sign paperwork leading to deportation. Many chose do so. That would mean a *large* percentage of parents of the 2,053 kids left in HHS custody may no longer be in USA. Experts have also questioned whether the government would honor the deportation-for-reunification agreement that the federal officials allegedly made. Cynthia Milian, a private attorney working with Tahirih, said: "I doubt they would put his child on a plane to get her to where he would get deported out from, especially if she’s in Arizona. I just don't see that happening." The US government has started reuniting families as a result of Donald Trump's executive order to end the separation of migrant families along the US-Mexico border. It does not end the "zero-tolerance" policy, which criminally prosecutes all migrants who illegally cross into the US, but vows to keep families together. The likely result of the executive order is children and their parents being detained together instead. A Department for Homeland Security "fact sheet" published on Saturday claimed that the US government "knows the location of all children in its custody and is working to reunite them with their families." It also added: "It should be noted that in the past many parents have elected to be removed without their children." The DHS added on Sunday night that it had reunited 538 children who were taken away from their parents at the borders as part of the zero-tolerance policy. The Health and Human Services Department, which is responsible for the separated children's wellbeing, added that more than 2,000 children remain in its facilities. It said it is working with other government agencies to "foster communications" and reunite them with families "via well-established reunification processes." The DHS did not specify how it was tracking and reuniting the families. Business Insider has contacted ICE for comment.